Travel with Clayton County Chamber members to China in 2019! The Clayton County Chamber of Commerce is offering a unique opportunity to travel and network with fellow chamber members and experience the rich culture and business climate of China. Through a partnership with Citslinc, International, the Clayton County Chamber of Commerce can offer a cost-effective trip to China on October 21 - 29, 2019. The trip includes stops in Beijing, Shanghai, Suzhou and Hangzhou with opportunities to visit historic sites like the Great Wall of China and Tian An Men Square and see the huge and modern cities of Beijing and Shanghai. 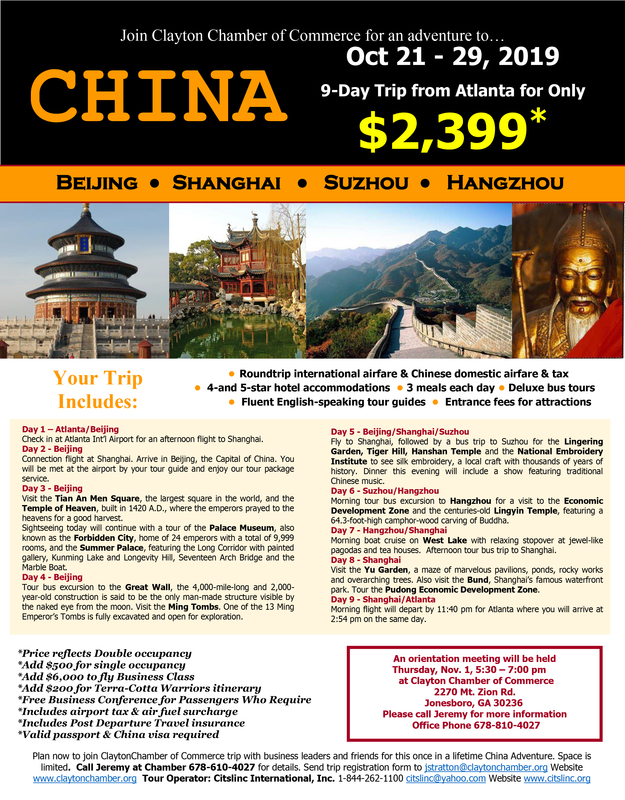 Plus, for the first time and for your convenience, the trip leaves from Atlanta directly for China! Prices are based on two-person shared accommodation, single occupancy is available for an additional charge of $500. This trip is also available to non-Chamber members for an addition charge of $150 per person. Please register today for the meeting, so we can get an accurate headcount for food. This informational session will take place on November 1, 2018.